Researchers from the NOAA have discovered two sunken vessels from a Second World War convoy battle about 30 miles off the coast of North Carolina. The German U-boat 576 and a merchant ship, Bluefields, were found just a few hundred yards apart. The find shows just how close the war came to American shores. "This is not just the discovery of a single shipwreck," noted sanctuary scientist Joe Hoyt in an NOAA statement. 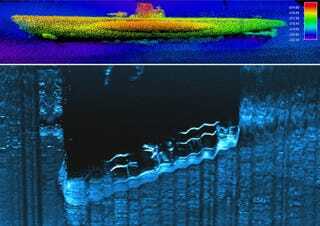 "We have discovered an important battle site that is part of the Battle of the Atlantic. These two ships rest only a few hundred yards apart and together help us interpret and share their forgotten stories." Indeed, when conjuring images of the Battle of the Atlantic, most people think of the cold and icy waters of the north. But as noted by the NOAA investigators: "few people realize how close the war actually came to America's shores. As we learn more about the underwater battlefield, Bluefields and U-576 will provide additional insight into a relatively little-known chapter in American history." The German U-576 departing Saint-Nazire, France. Photo: Ed Caram. So here's what happened: On July 15th, 1942, Convoy KS-520 — a group of 19 merchant ships escorted by the U.S. Navy and Coast Guard — began its perilous journey to Key West, Florida from Norfolk, Virginia. The convoy came under attack off Cape Hatteras. The U-576 sank the Nicaraguan freighter Bluefields, and severely damaged two other ships. In response, U.S. Navy Kingfisher aircraft, which were providing cover, bombed U-576 while the merchant ship Unicoi attacked with its deck gun. Both the merchant ship and U-boat were sunk within minutes, resting on the seafloor just 240 yards apart. Remarkably, the crew of the Bluefields was saved, but all 45 crew of the U-boat were lost. The wreck is considered a war grave and is protected by international law. Interestingly, just one day before this battle, the U-boat's commander, Kapitanleutnant Hans-Dieter Heinicke, radioed back to his commanders in occupied France to say that his sub was damaged and that he was heading back to Germany after a month-long patrol without success against Allied shipping. "In spite of his damaged ship, Heinicke decided to attack at all costs," notes the NOAA. "However, at 4:00 pm, just before he could fire his torpedoes, one of the Coast Guard cutters picked up a sonar contact. The Coast Guard crew dropped three depth charges, followed by five more 10 minutes later." Undaunted, Heinicke pressed his attack, firing off four torpedoes at about 4:15 PM. Minutes later, both the Bluefields and U-boat were at the bottom of the ocean.